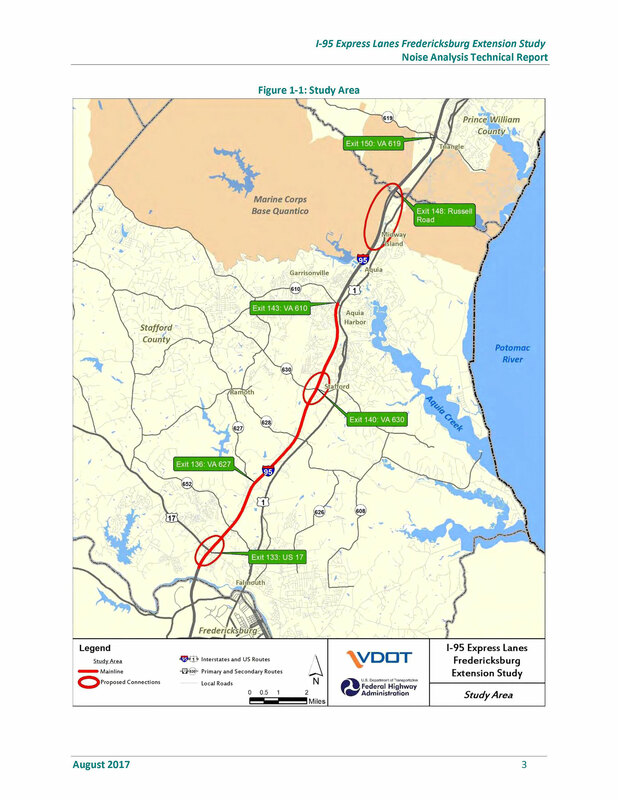 HMMH conducted the air quality and noise analyses for the Fredericksburg Extension Study as part of the I-95 HOT Lanes Project. The study area extends along I-95 from Exit 133 (US 17 N) at Warrenton Road to Exit 148 at Russell Road, with improvements proposed along the southern ten miles and at Russell Road. Improvements under consideration included expanded express lanes and new express lane access points. Potential impacts for carbon monoxide (CO) were conducted for the freeway and interchanges along with nearby intersections that might be impacted by the project. Worst-case interchanges were identified based on Level of Service (LOS), traffic volumes, public access, and reasonableness. For intersections, worst-case locations were identified from a list of 15 potential intersections that were ranked based on peak volumes and LOS, then screened for modeling using the 2016 FHWA-Virginia Department of Transportation Programmatic Agreement. For worst-case intersections and interchanges that did screen out using the PA, a CO hot spot analysis was conducted using the EPA MOVES and CAL3QHC dispersion model where modeled concentrations were compared to the National Ambient Air Quality Standards for each Alternative and condition. As the Study Alternatives are anticipated to add significant capacity to the existing and/or proposed new roadway networks, a quantitative Mobile Source Air Toxics (MSAT) analysis was conducted consistent with the latest 2016 FHWA guidance. The Affected Network was identified for each Alternative, and project-specific MOVES files were developed to estimate emissions for the nine MSAT pollutants for each Alternative. A qualitative analysis was also prepared to address indirect and cumulative impacts from the project as well as construction emissions. HMMH also supported the noise analysis by providing the loudest-hour traffic data processing and determination of the loudest-hour traffic to be used for all roadways in all alternatives. HMMH prepared the draft and final noise technical report and graphics.